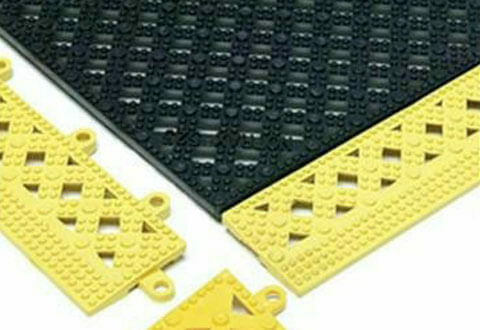 Our rubber and PVC connectible tiles are for multiple flooring uses and are interlocking or connectible anti-fatigue anti-slip floor tiles for temporary or permanent flooring replacement. They feature anti-fatigue and anti-slip qualities with oil and grease resistance - and with a drainage ability there are numerous uses for the different products in this section. 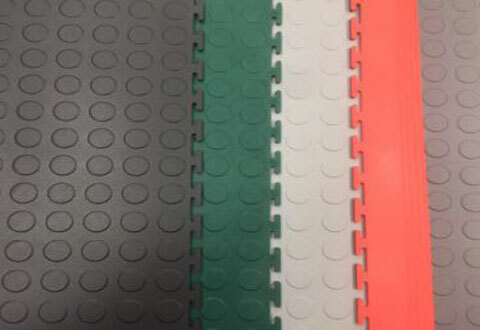 Octo interlocking rubber tiles are high quality interlocking rubber drainage floor tiles at 13mm thick, and is available with anti-trip bevelled edges. They are soft and comfortable underfoot giving good slip resistance and anti-fatigue properties. These floor tiles are ideal where a requirement for excellent drainage is sought for safe standing or working. They are perfect for kitchen and bar areas in grease and oil resistant red, or for outside walkways in general purpose black. 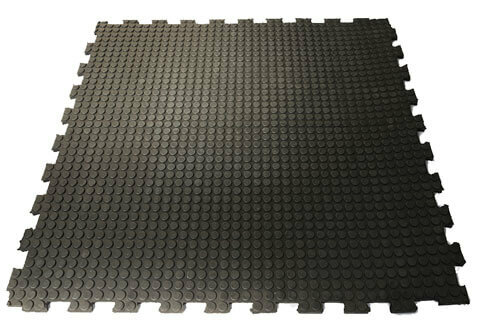 Stud interlocking rubber tiles are heavy duty rubber interlocking gym floor tiles. They are economical yet the superior quality stud design surface offers anti-slip characteristics from any direction of approach. 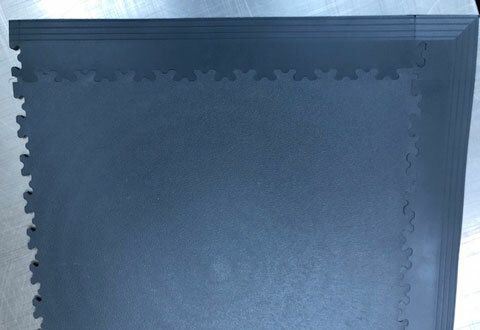 Surelok Stud heavy duty rubber puzzle tiles require no adhesive and can be laid directly over existing hard flooring in most cases and is also ideally suited for loose lay applications for walkways, treadmats, runners and general purpose industrial and commercial areas. They are an excellent choice for gym, exercise and weights areas. 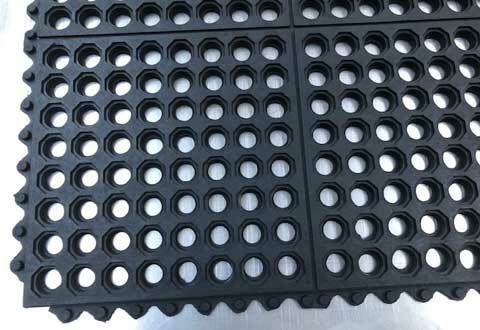 Circle stud PVC interlocking tiles are hard wearing coin pattern coloured interlocking floor tiles with a popular circle stud pattern. This anti-slip tile is ideal for traffic from any direction and is manufactured from a high quality soft feel PVC. The tight fitting 'T' bar edge pattern limits any movement when connected so eliminating the need for adhesion. They have very good cold to floor insulation and are hard wearing and durable with an easy cleaning and aesthetically pleasing appearance. The tiles are excellent for covering a worn floor area or painted garage floor area and are quick and easy to fit requiring no special skills, tools or adhesives. They are available in 457mm x 457mm x 5mm in a full range of colours. Bark pattern PVC interlocking tiles are anti-slip solid PVC interlocking floor tiles manufactured from high quality soft feel PVC. The popular bark pattern of the anti-slip interlocking floor tile is ideal for multi-directional traffic - and they are high impact resistance and hard wearing. They have a strong 'T' bar connection making the tiles easy to fit and stay connected without the use of adhesive. They are available in 50cm x 50cm at 7mm thick and in numerous colour ways. Deck PVC connectible tiles are high quality flexible tiles incorporating a unique multi-directional pattern. The anti-slip floor tile multi-directional pattern allows for exceptional drainage. They are a cost effective solution in kitchens where flowing water or liquids makes for unsafe passage - and they are resistant to kitchen oils and grease. Suredeck is available in 30cm x 30cm x 14mm thick and in various colours.